The first thing I noticed was the bad state of the peers. This case is covered in GlusterFS documentation. NOTE: If you’ll find your peers in Accepted peer request state after following the manual - restart glusterd one more time. [heketi] ERROR 2017/03/24 12:24:51 /src/github.com/heketi/heketi/apps/glusterfs/app_volume.go:148: Failed to create volume: Unable to execute command on glusterfs-6bjq2: volume create: vol_9d00fda936724e9f0500575f734b8fe3: failed: Brick: 192.168.11.69:/var/lib/heketi/mounts/vg_d16a4532c7879392d4546009d7dab6d0/brick_2830bc82e8836bb5913949ca32d0f8d4/brick not available. Brick may be containing or be contained by an existing brick. I spent several hours trying to heal volumes using all possible commands from GlusterFS mailing lists, and different manual, but it didn’t help. Heal command showed that everything was fine. But old volumes were empty inside the PVC. At some point, I realized that it’s easier to recreate the whole cluster. So I started to look how to get data from my volumes. 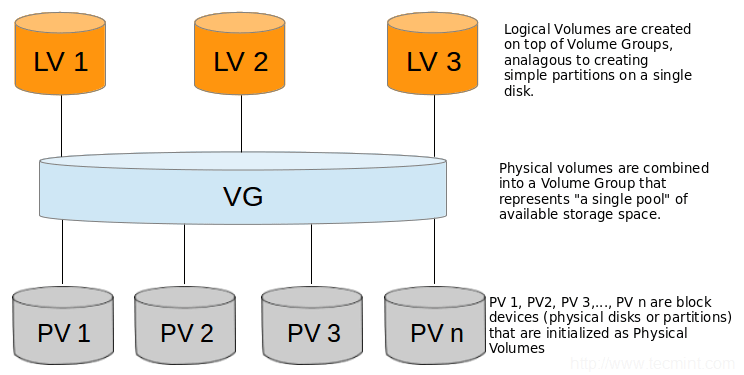 Logical Volume(LV) - an equivalent of a disk partition in usual system. For recovery, we need to ssh to the data node. We will only need information about Logical Volumes, but for better understanding, I added similar commands for PV and VG. What we need from all of this is the output of the lvdisplay command. Specifically its LV Path . Because we can mount it as a usual disk. Since I had more than 30 of GlusterFS volumes, I ended up with this bash one-liner. It mounts each volume to its own directory. Now you can inspect volumes and copy your data from the bricks as usual. All data save and disks are clean. Time to deploy GlusterFS again. I was very interested to see whether anything has changed since my previous experience. So I decided to follow the installation manual from the beginning. I was pleasantly surprised that I didn’t face any of the problems I had before. It’s probably due to the non-fresh system. Instead, I faced a new problem because of the this. Adding device /dev/sdb ... Unable to add device: Unable to execute command on glusterfs-b0n9m:   WARNING: Not using lvmetad because config setting use_lvmetad=0. Can't open /dev/sdb exclusively. Mounted filesystem? Adding device /dev/sdb ... Unable to add device: Unable to execute command on glusterfs-xnftq:   WARNING: Not using lvmetad because config setting use_lvmetad=0. Adding device /dev/sdd ... Unable to add device: Unable to execute command on glusterfs-x4kdf:   WARNING: Not using lvmetad because config setting use_lvmetad=0. Can't open /dev/sdd exclusively. Mounted filesystem? Running pvscan --cache as suggested didn’t help. Neither as deleting all LV, VG, PV. It didn’t work even after a reboot. At the end, I found the solution on stackoverflow. # kubectl delete all,service,jobs,deployment,secret --selector="deploy-heketi"
After this, heketi-cli cluster info returned me nothing. I thought that may be I didn’t wait until the end of deployment job to finish. Following the manual for the second time gave me the same result. After some debugging, I traced the problem to the empty heketi.db in heketi-db-backup secret. Setting heketi.db value from the generated heketi-storage.json file seems to fix the issue. I don’t know what caused the problem with my storage. One of the guesses is some network related issue. I didn’t lose any of the data but there were some scary moments :). I will continue to use GlusterFS on staging cluster, but for now, I’m not ready to use it in production.